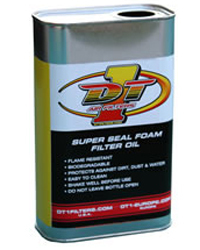 DT-1 filter oil is a biodegradable high quality product. It is tested and formulated for maximum protection. It is flame resistant which eliminates any further need to run a backfire screen in your bike. this is by far the best oil i have ever used, It applies super easy ans once the oil air dries a bit it becomes super tacky. I did a no no and went to very very dusty enduro races without cleaning and i was worried but the DT1 filter and the DT1 oil saved my engine!!! !